What do you usually do at weekend? It's little bit unusual case found at eMedicine Case Presentation about Oral Healt and Dentistry, but I managed to found one of it. A 78-year-old man presents to the oral surgery clinic complaining of discomfort along the left lateral border of his tongue. He states that he first noticed a lesion on his tongue approximately 4 weeks ago, and since that time it has progressively become larger and more bothersome. The patient denies having any fevers, chills, drainage at the site of the lesion, or generalized swelling in the head and neck. A blade implant was placed in the left mandible 15 years ago to restore the lower left 1st and 2nd premolar teeth (a blade implant is an older system to replace missing teeth; this has been replaced by the use of single or multiple titanium implants to replace missing teeth). He has no known chronic medical conditions. He has no allergies and does not take any medications. He reports a 30 pack-year history of smoking, as well as occasional alcohol use. On physical examination, the patient appears well-nourished and in no apparent discomfort. His vital signs include an oral temperature of 99.5°F (37.5°C), a pulse rate of 78 bpm, a blood pressure of 134/88 mm Hg, a respiratory rate of 14 breaths/min, and an oxygen saturation of 98% while breathing room air. The cardiovascular, respiratory, and abdominal examinations are normal. His head and neck examination is negative for any gross swelling or lymphadenopathy. The intraoral examination reveals an indurated nodular mass 1 cm × 1 cm in diameter on the left lateral margin of the tongue with 2 separate areas of ulceration both superior and inferior to the mass (see Figure 1). The mass is not tender to palpation and is without any bleeding or drainage. There is no sublingual elevation, induration, or asymmetry, and his maximal oral opening is measured at 45 mm. Well-healed incisional wounds from his prior restorative work of the left mandible are noted. The initial workup consists of a panoramic radiograph, a culture swab, and an incisional wedge biopsy of the lesion. 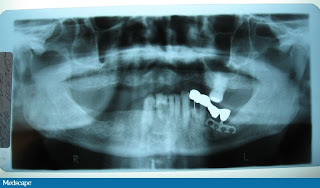 The panoramic radiograph shows the blade implant in place in the left mandible (see Figure 2). There is minimal bone destruction around the blade implant and no other bony pathology can be seen. The biopsy specimen is sent for histopathologic diagnosis (see Figure 3). Hint: Definitive diagnosis requires close examination of the microscopic biopsy specimen. he diagnosis of actinomycosis was made based on the patient's physical examination as well as the histologic and microbiologic evaluation. 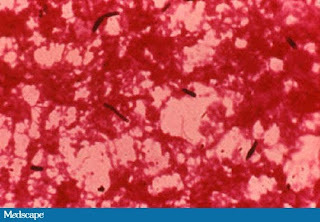 The wedge biopsy demonstrated marked acute inflammation, microabscess formation, and visible organisms morphologically consistent with actinomycosis (see Figure 3). This case is an atypical presentation of actinomycosis of the head and neck. A more common presentation consists of chronic submandibular swelling, usually brawny induration with fistula formation and purulent drainage. 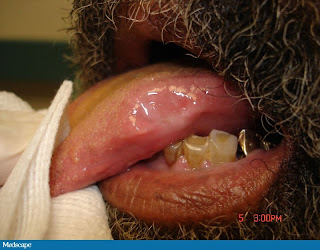 The presentation of actinomycosis on the tongue itself is also unusual. Firm masses with associated ulceration on the lateral border of the tongue in the presence of a significant tobacco and alcohol history is usually associated with malignancy, typically squamous cell carcinoma. Although the presence of a chronic, firm swelling is consistent with actinomycosis infection, malignancy must also be considered. Therefore, in addition to the microbiologic analysis, an incisional biopsy of the lesion must be obtained. Histologically, actinomycotic lesions are characterized by mixed suppurative and granulomatous inflammatory changes. There is proliferation of the connective tissues and the presence of sulfur granules. Under the microscope, sulfur granules may appear cauliflowered at low magnification, whereas at higher magnification the inflammatory reaction can be seen. These granules may be visualized in preparation of the biopsy specimen while the test tubes are being rotated manually. They can also be identified by washing sampled material and crushing it between a slide and coverglass after it has been Gram-stained. With Gram staining, these microcolonies contain Gram-positive, filamentous or branching bacteria. Occasionally, companion bacteria may be observed. It is important to stress that similar granules can be found in other bacterial infections, such as Nocardia infection and botryomycosis. Botryomycosis refers to a Staphylococcus aureus infection that mimics actinomycosis. Nocardia may be differentiated from Actinomyces since it is acid-fast when stained. Gel diffusion methods and fluorescent antibody tests (immunofluorescence with fluorescein isothiocyanate antiserum) are also helpful because they can differentiate A. israelii from other filamentous anaerobes that produce granules in tissue. They can be used retrospectively with formalin- and paraffin-embedded biopsy specimens. Biopsies of the granulomatous lesion or of the fistula are especially useful when no purulent material is present and when the diagnosis remains unclear despite laboratory evaluation. In the absence of absolute bacterial identification from culture, the diagnosis must rely on the clinical presentation and histopathologic findings. The patient in this case was started on a course of oral penicillin VK at 500 mg every 6 hours for 3 weeks for treatment of the actinomycosis infection. Because it was felt that the blade implant and associated prosthesis could be harboring actinomycotic colonies and could seed more bacteria in the left lateral tongue, it was decided to remove the blade implant along with the prosthesis supported by the implant. The patient was followed for approximately 1 month, at which time total resolution of the lesion was observed (see Figure 4). You are examining a patient who you suspect may have an actinomycotic infection. As part of the history, the patient mentions that he had dental surgery earlier this year. He states that he often has gum infections, likely as a result of his admittedly poor oral hygiene habits. Which of the following factors in this patient's history could contribute to the development of actinomycosis? If the patient described above were to be diagnosed with actinomycosis, which of the following choices would be the most appropriate initial course of treatment?